We have been in a Halloween state of mind here at Nanigans the last few weeks. 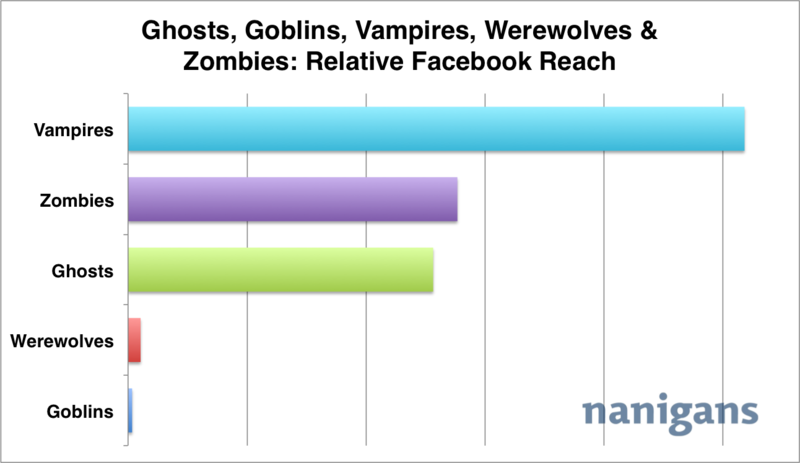 With the holiday weekend upon us, we couldn’t resist comparing the Facebook popularity of our spooky friends: Ghosts, Goblins, Vampires, Werewolves and Zombies. Clearly, Vampires take home the bounty in terms of Facebook popularity. About twice as many people on Facebook mention Vampires in their profiles than the next most popular, Zombies and Ghosts. Werewolves and Goblins, perhaps to no surprise, are considerably less popular. 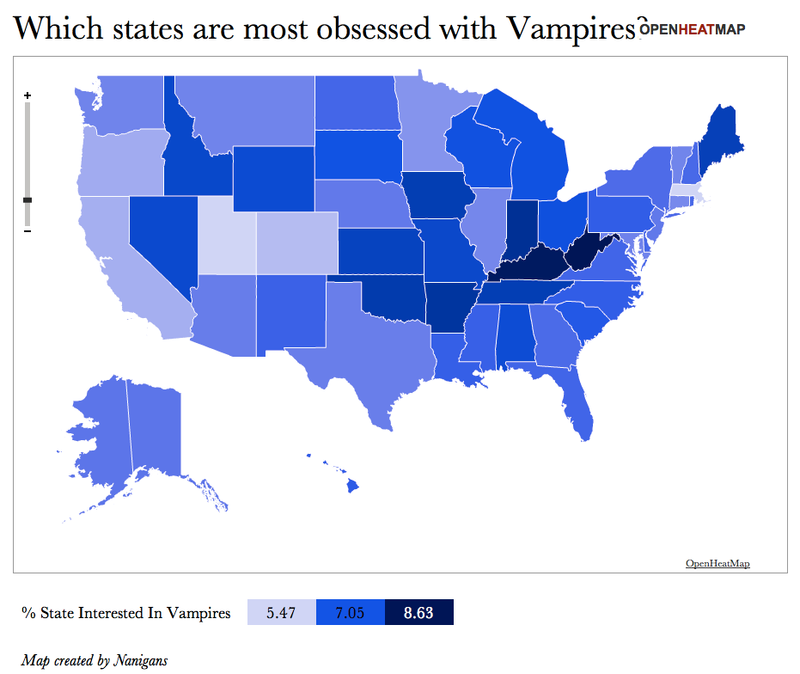 Given the degree of Vampire popularity on Facebook, we were curious if particular states or regions in the United States had greater interest than others. We pulled Vampire popularity by state, and the below map depicts the portion of that state’s population on Facebook who mention Vampires in their profiles. Those states with the greatest Vampire obsession seem to be in the northern part of the Southeast: West Virginia, Kentucky, Indiana, Arkansas and Oklahoma. Those states with the least Vampire obsession: Massachusetts, Colorado, California, Oregon and Minnesota. 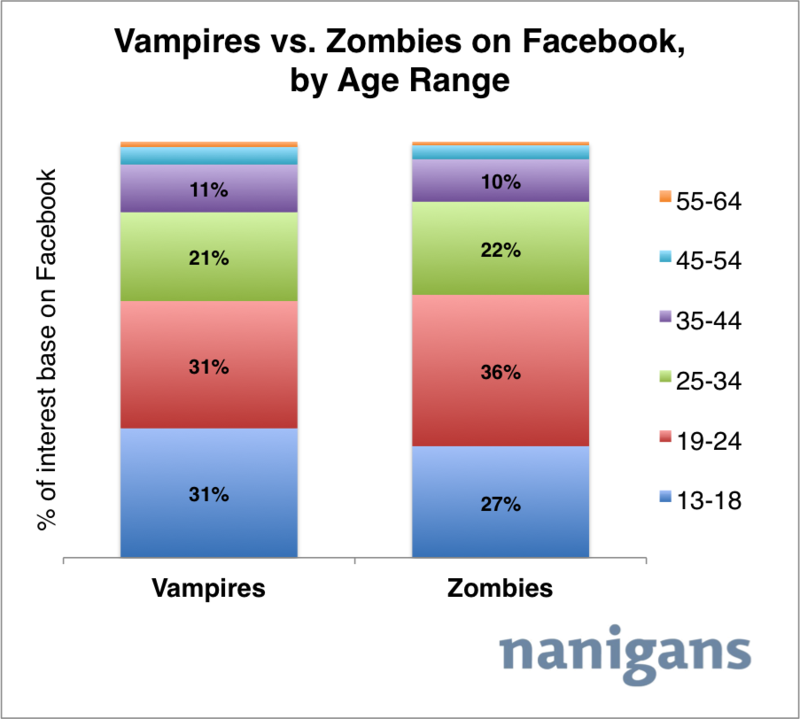 Given the epic battle between Vampires and Zombies, we also dove into the demographics of their interest base on Facebook. 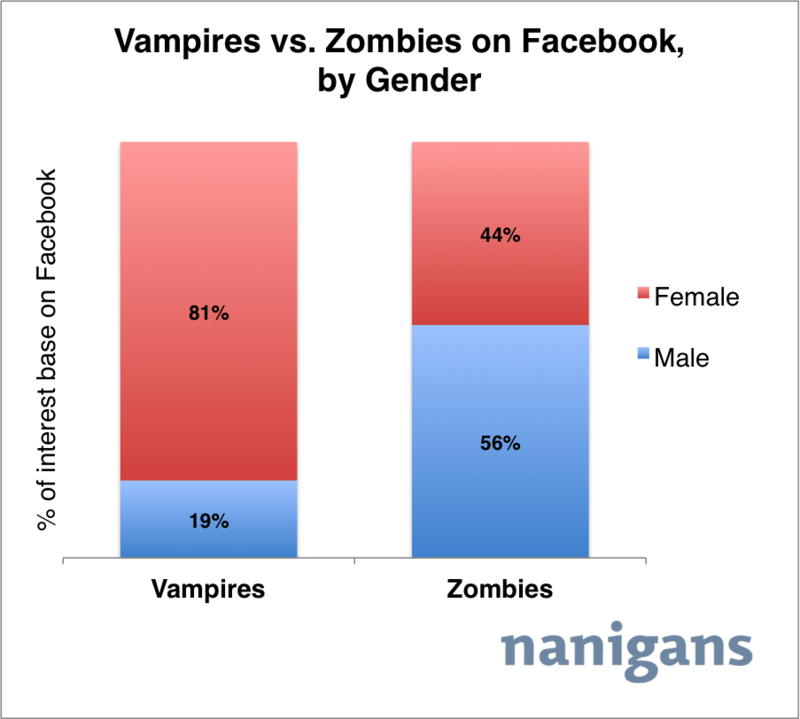 You might guess that more females than males are obsessed with Vampires, and that more males than females are obsessed with Zombies. And you would be right; but, did you expect the difference to be so dramatic for Vampires and this close for Zombies? When diving into and comparing the age breakdown of those interested in Zombies and Vampires, we see similar age range compositions. The only difference seems to be that a slightly larger portion of people interested in Zombies fall into the 19-24 range.